So I’ll admit I’ve only traveled overseas once since I found out what “real beer” is. I’d traveled through Western Europe before in high school and college. The high school trip was through France which, even though I love, is a beer wasteland. They’re all about their wine, and only being 18, was closely watched. We did manage to score some booze, but it was only wine. The second time was in college and my idea of great beer was a “30 Stone” for $9.99. I can’t wait to get another chance though. The bier gartens in Munich may be the best places on Earth. You’re in a beautiful park, there are women bringing you litre mugs of beer, and Germans are the nicest people you will ever meet. Nothing against any other cultures or peoples, but from my experiences it’s true. Unfortunately because my only concern as a 19 year old college student was getting as drunk as possible, I didn’t explore the true beer scene. However, I probably was too young and dumb to appreciate it. From my naïve experience though, I will say, take any chance you can to get over there. If not for the beer, then for the experience. I always liked Europe, but until that night in Munich I didn’t love it. When I decided to actually concentrate on school and went back as an adult, part of my program was to travel overseas. I was fortunate enough that my university sent me to central and Eastern Europe. My first stop was in Budapest, Hungary. My second shot at college was at a Christian university that forbade drinking by their members and their students. I was fortunate again that the professor leading the trip knew we were adults and she allowed me to explore a little bit. We were only there for two days and were busy actually learning. I did stop into what I’d call a bodega here on the first night and grabbed the first beer I saw, Dreher Classic. Lager beers are the predominant style in this area, and that’s what this was. I bought another six pack to bring home for my friends to try. Unfortunately in the post-911 world my bags were searched and it magically disappeared between Amsterdam and New York City. The bulk of the trip was spent in Bratislava, Slovakia. It’s like Prague without gangs of tourists. We had an apartment in the old city for the two weeks we spent there and around the corner from it was a bar called the Dubliner. Obviously this is an Irish pub with an Irish theme and décor. The comments on the site about it being scary I don’t remember. Lots of Brits there, and they do tend to get crazy. 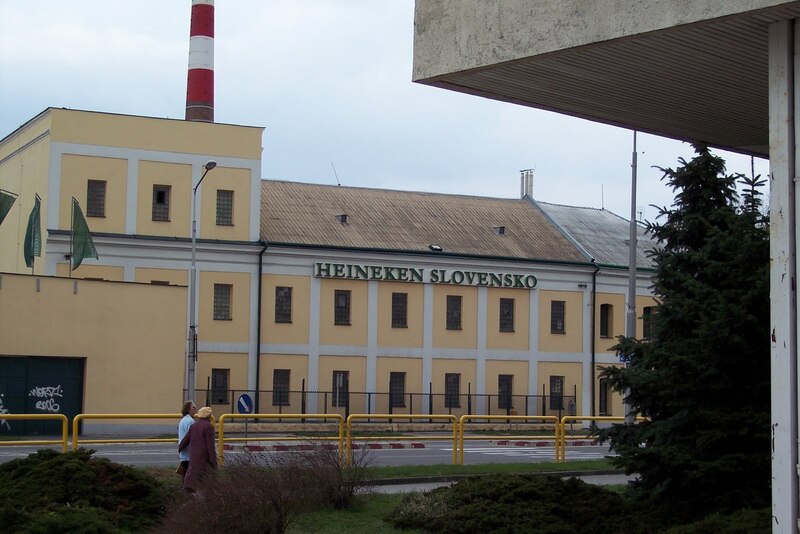 It was there though that I discovered Zlaty Bazant which is Slovakia’s national beer. Another light lager, but when you find all you have to say is “Pivo prosím” and they give you a pint for what equals $1 you don’t question it. It's available in the States under the name Golden Pheasant. Another night I convinced a few of my classmates to go with me to a Belgian beer bar a few blocks away, Café de Zwaan. There I enjoyed fresh beers from the best Belgium has to offer. I have to say though, I still didn’t know enough about good beer to truly enjoy what I was drinking, but I feel I learned a lot. I, along with another student, took a day over the Easter weekend to travel up to Prague, Czech Republic. I have to say it’s probably one of the most beautiful cities to which I’ve ever been. Sadly though, you’re asses-to- elbows with tourists. The Charles Bridge, which is amazing, I was literally shoved across. While we were stuck in a mass of people we ran down a side street to escape the old people in tourist groups and went into a small pub. I have no idea what I drank there to be honest. I just needed out of those crowds. 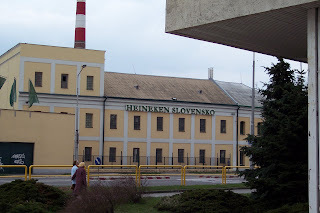 It was a Pilsner, the Czech Republic being the birthplace of the style, and it was delicious, either because of the craft behind it or the relief of not being in a mob. One final note. Budweiser is actually named for the city of Budweis, Czech Republic (Ceske Budejovice) that has their own beer. Here it is called Budvar. 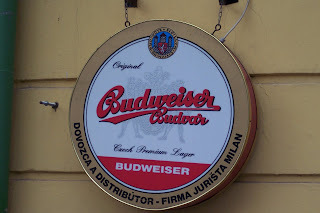 In CR and Slovakia it is sold as Budweiser. The American version is sold as “Bud.” Just an interesting factoid I learned while there. 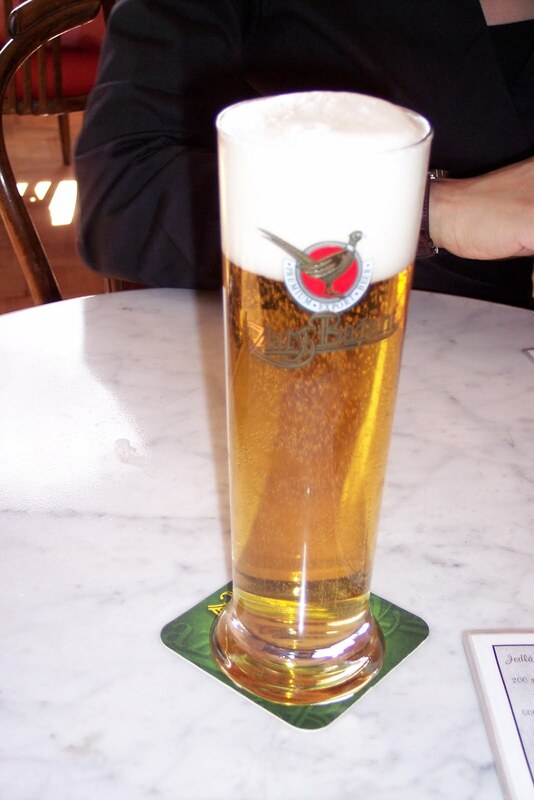 I hope to make it back to Europe in the next couple years and fully experience the beer scene in Belgium and Germany. In the interim though, I count myself lucky to have enjoyed the beers that I have. In late December, we took a quick trip out to Western Kansas to visit some of the great breweries and brewpubs the Sunflower state has. We left on a Friday morning and headed towards Manhattan. We had the full crew except Ed for this trip. Our first stop was Little Apple Brewing Company located on the western side of Manhattan for an early lunch and the first beers of the trip. We met with the head brewer, Kris and he chatted with us for awhile as we waited for our food. He was really friendly discussing the beers they had on tap, including almost everyone’s favorite that day, a seasonal brewed with hazelnuts. After we had lunch, Kris showed us around their brewing facility while we finished up our brews. It was a really good stop as Kris was great and the staff was really helpful. After lunch, we drove about two hours to Gella’s Diner and lb Brewing Company. I mention that it was just two hours at that was a topic of discussion. A lot of people think Hays is further out, when in fact it’s about four hours from the KC metro area. We’ve been to Gella’s before, as it was the first stop on Beer Trip II. It’s located in Hays’ old downtown in a historic building, but inside is new and modern. An absolutely beautiful place. The brewing facility is the cleanest I’ve ever seen. Every piece of equipment sparkles. Unfortunately, the head brewer, Gerald, was feeling under the weather. He said he didn’t want to get us sick so he just stopped by and said hi real quick before going home to recover. Gella’s always has a huge selection of beers on tap, including their 2009 GABF gold medal winner Liberty Stout. Kelly, knowing this was his last bit of fun before tax season, probably had the most fun of us all and ended up having to curl up in the EM-50 to wait the rest of us out before we went back to our hotel in Hays. The next morning we were up and headed to the tiny town of Beaver, KS. Even native Kansans have never heard of it. Just for future reference, it’s located about 20-30 minutes south of Russell, KS. Huge help, right? Anyway, Len and Linda Moeder run a tiny oasis in the middle of BFE Kansas. It’s a small town establishment where people know you’re from out of town (although, in a town the size of Beaver, not a hard accomplishment). Len and Linda run it all themselves, but they still found time to come over and talk to us both times I’ve been there. He’s even growing his own hops now, and the beers are great. After Mo’s, we headed back to Manhattan, this time the east side, to Tallgrass Brewing Company. We met up with Jeff Gill, the owner and head brewer, before their regular tour. He showed us around the brewery keeping us supplied with beer the entire time. Tallgrass has expanded rapidly in the few short years it’s been open. It’s always good to see another Kansas brewery succeed and start distributing to other states. Jeff let us try a beer that he was experimenting with, and even asked for our thoughts about it. We all agreed that we hoped it was in their future line up. We shared some of the beers we brought as well with him in their tasting room, and had a great time talking with Jeff for a couple hours until the normal tour people started showing up. He even put the Tallgrass sticker on the back of the EM-50 for us, which was pretty cool. The final stop of our quick trip was to Blind Tiger in Topeka, KS. They’re a perennial GABF winner and they didn’t fail to impress us either. It was getting late so we had just a quick meal there before we headed back to KC. Overall a great trip to the great breweries in Kansas to the west of us. They’re not far off I-70 so anyone traveling out to Colorado needs to make the effort to stop and support these great locally owned businesses. Hey everyone! I hope you are having a great 2010. It has been pretty good on my end, with Beer Trip 5.5 being one of the best trips we’ve taken. Speaking of 5.5, when we were coming back home after the last stop that trip, I was thinking about our stop at Front Street Brewery. Saturday night, we went to the Quad Cities and stopped at Bent River Brewing Company. You may recall that we stopped at Bent River on the very first Beer Trip in 2005. It was just Tim and I on that trip, and we were actually the only two people in the place when we arrived on a Sunday morning for an early lunch. There, I had one of the best burgers I’d ever had in my life (a patty melt) and enjoyed samples of some really good beers. It was a really good stop. We were all looking forward to going there this year, but the vibe was a lot different. The place was packed, which I was fine with, but there was a band playing that was not very good (to state it kindly) and the people at the brewpub were a little on the tool/bar trash side. It wasn’t a good scene that night. To be fair, their beers were still very solid and we didn’t order food, but the experience wasn’t what we were hoping for. We stayed there for maybe 45 minutes before we decided to check out the lesser known Front Street Brewery. When we got there, there were a few people hanging around the bar, which was a very esthetically pleasing interior (it was too dark to tell you how it looked from the outside). We sat down, were greeted by a very cool bartender who set us up with some beers. He even came over and talked to us about our trip, and even came back a couple of times to bring us some free samples. The beers were pretty good, but nothing like a barrel aged Imperial Stout or something like that. The thing is, this stop became one of my favorites because the bartender treated us really well and the beers were enjoyable. This is one of the points that I try to let people know about Beer Trips. Often when I tell someone about where we’re planning to go on the next Beer Trip, I get a lot of weird and confused reactions from people like “Why are you going to that place?” A lot of “The beer at Beer Bar A is way better than the beers at Brewery X!” comments come in my direction. And I get that completely. It’s just that for me, having the best beer isn’t necessarily the most important thing to me. Now it is really important, don’t get me wrong, but it doesn’t make me enjoy one stop over another. For example, Rogue Brewery in Newport, OR makes some really great beers. I have enjoyed their beers for a long time, and we all were really looking forward to making the visit from Portland on Beer Trip IV. But the tour was one of the biggest disappointments I’ve had on a beer trip. The tour guide was pretty bad. She wasn’t that informative, she was a little rude, was really boring, and at the end of the tour she said, “No samples but you can buy beers upstairs.” That was the only tour without samples that I’d ever been on, which wouldn’t have been a big deal if the tour itself was good. On the other hand, for Beer Trip V, we were driving up from Milwaukee to Green Bay, and we wanted to have a stop along the way. We randomly decided to stop at Hops Haven Brew Haus in Sheboygan, a stop that was questioned by several people. When we arrived there mid-afternoon on a Thursday and were greeted by our wonderful bartender Amy. She was great, knew her stuff, and was absolutely pleasant. We asked her if they had any stickers to but on the RV, and she went and spoke to the brewer. Jeff, a great guy who made us a laminated sign in lieu of a sticker (they didn’t have any) showed us, along with our new friends of about 10 minutes Colleen and Grant, around their brewpub, even showing us a video they had of the place. Amy and Jeff couldn’t have been cooler to us, and this was a stop that most people wouldn’t have made. It was one of my favorite stops on any of the Beer Trips. And it didn’t hurt that their beers were fantastic, either. So that is the story to why I do what I do in terms of Beer Trip planning. To me, I’d rather have an above-average beer at a brewpub with great people than have a fantastic beer at a snobbish beer bar (which I have found several to be). The people I’ve dealt with at the brewpubs are a lot more passionate about what it is that they are serving because it is their hard work behind it. While I appreciate the finer beer bars a lot, especially the ones that support their local breweries (the Twin Cities are phenomenal in my opinion when it comes to that), I’d rather have our guys go check out a place where we can ask the brewers direction why and how it is that they do what they do than have a server tell me that the IPA I’m drinking is 93 IBUs. But that’s just me. Anyway, that’s what I have for you this week. We are going to be doing a better job of keep this site updated, so check back. Beer Trip 5.5 would be different than our previous "Point Fives". Usually we left on a Friday morning and came back on Saturday night. This year we extended the trip by one day and didn't come back until Sunday. We set out Friday morning heading north. This trip we had myself, Dan, Andy, Rob, and Dave the newbie. Our first destination was Court Avenue Brewing Company in Des Moines, IA. Located in an older area of town, CABC has a great atmosphere, with brews to match. We enjoyed a delicious meal with our brews and then set back out, this time headed east. Our next stop was in Rock Island, IL and the Blue Cat Brewpub. Located near the river, it was obvious this was a popular gathering spot. We sampled their offerings and moved back out to the RV. From there we headed towards Chicago. There, we were to meet some good friends we met through a beer site, John and Travis. They’d hung out with us on BT V when we were in Wisconsin and they were driving down to Chicago to enjoy the Beer Trip experience once more. We met them at Two Brothers Brewing in Warrenville, IL. To say the location was odd is an understatement. It was dark but it appeared to be in the middle of an industrial/office park. The restaurant itself seemed to be a cookie cutter office building. Fortunately the inside didn’t match the drab outside. The place was packed and we had to wait for quite a while to get our table. It was worth it though. We stuffed ourselves and tried several of their beers. From there we checked into our hotel and went to our last stop of the night, Lunar Brewing in Villa Park, IL. They were what I think of as a local hangout bar. It’s a small place, but hopping. We were able to get a quick look at the brewing setup. It was very small which made it even cooler. There was a somewhat heated argument about beers being liked solely on the label. Unfortunately one of the group’s favorite breweries was used as an example. It ended up okay though, ‘cuz beer people are about the beer and we still had a great time. After Goose Island, we made a quick stop at Molly’s Cupcakes so Dan could get some Ron Bennington cupcakes, named in honor of the host of XM’s The Ron & Fez Show, 11AM-3PM XM 202, Sirius 197. After enjoying those, we moved on to Revolution Brewery. They had only opened a few weeks previous, but had heard nothing but good things. We were lucky enough to have a friend hook us up with one of the investors, Matt Rollins, formerly of Southern Tier Brewing out of New York, and the “Matt” of Phin & Matt, one of Southern Tier’s beers.. He met us at the bar there and took us through the whole operation. Very cool place and can see it becoming one of the big brewpubs in the city. After Revolution we stopped at Half Acre Brewing for a few quick samples and to buy a couple of bombers. Then we went to Piece Pizzeria and Brewing. Again, another packed brewpub. Chicago is really moving up in the beer world and the people are going with them. Great pizza as we had heard and great beers as well. We had to say goodbye to John and Travis at this point. They were staying the night and hitting the beer bars like The Map Room. We, on the other hand, piled back into the RV and headed back west to end the night in the metropolis of Moline, IL. In Moline we went to Bent River Brewing. There was a band playing and the place was standing room only. We managed to snag a booth and had a few beers before deciding to see if there was more room at Front Street Brewery in Davenport, just across the river in Iowa. Cool little place that was nice and quiet. Hung out with the bartender for a bit and then headed to the hotel to crash. The next day we only had one stop on the way back to KC, Olde Main Brewing Company in Ames, IA. This was the very first brewery stop on the very first Beer Trip back in 2005 so it was pretty cool to be back. We had a few beers and gorged on the buffet before packing it in and going home. An awesome trip overall and much nicer having that extra day so we weren’t so rushed. Looking forward to Beer Trip VI in just over a hundred days. Look out Colorado. We’re coming back!